Nearly three weeks into intense fighting in the Sudanese border state of South Kordofan the Sudanese government appears intent, in the face of international condemnation, to add to the already long list of serious international law violations that reports say its forces are committing on the ground. [L]ocal authorities entered the area around the UNMIS compound near Kadugli town and informed displaced people that Kadugli town was now safe for them to return to their homes, and that services would no longer be provided at that location but rather in areas of return. A radio broadcast by the Ministry of Health two days earlier similarly encouraged displaced people to return home. Those whose houses were destroyed in the fighting were told that they would be registered, provided assistance, and accommodated either in schools or at Kadugli Stadium. Vehicles were provided by the state government to transport them back to their places of origin. By the next day, almost the entire displaced population around the U.N. compound had returned to Kadugli, the report said. It is unlikely that these “local authorities” (possibly the very authorities who either authorized, observed, or committed reported executions of civilians based on ethnic and political affiliation, and house-to-house searches of SPLM sympathizers) would be trusted by the population who fled such abuses. It’s also unlikely that the situation in Kadugli is secure, given the presence of landmines and the fact that fighting outside the town continues. So what compelled civilians to return? A “combination of incentives through assistance and intimidation was used to exert pressure on the displaced people to return to Kadugli,” the OCHA report said. An internal U.N. report obtained by the AP today reveals even more insidious—and illegal—methods. Sudanese intelligence agents pretending to be Red Crescent workers entered a U.N.-protected displacement camp and ordered the displaced people to go to a stadium, according to the U.N. report. The people in the camp were threatened with being forcibly removed if they did not comply. The account adds details to remarks by a top U.N. humanitarian official on Tuesday who warned that the condition of those who had left the IDP camp around the UNMIS compound was unknown due to restrictions imposed on humanitarians. Obstruction of aid and the manipulation of population movements have long been strategies in Khartoum’s playbook on managing the restive segments of its population. 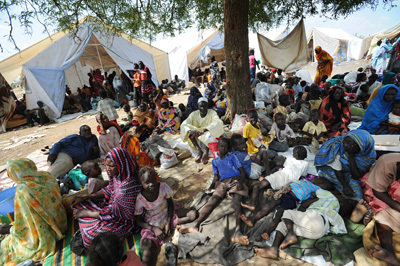 In Darfur, government restrictions on peacekeeper and humanitarian movements (often citing ‘security concerns’), expulsion of aid agencies, management of where aid is or is not allowed to go, censorship of information coming out of the region, and eagerness to dismantle displacement camps on questionable grounds, have long been documented. The purposeful displacement of populations was employed during the second civil war as a means of securing oil-rich lands in the South. In the Nuba Mountains of South Kordofan, the government forced the Nuba into “peace camps” where the population was controlled and reprehensibly abused. Today, the airport in the capital of Kadugli, a critical supply line, remains closed and humanitarian movements restricted. Six national U.N. staff were arrested by Sudanese authorities. And now, government security agents are posing as humanitarians to forcibly disperse the already vulnerable from a U.N. compound, where – though protection by peacekeepers is far from guaranteed – there is still relative safety, monitoring, and some aid.